CPD Arrest Two Adair Men Following Shots Fired and Theft of a Police Cruiser. 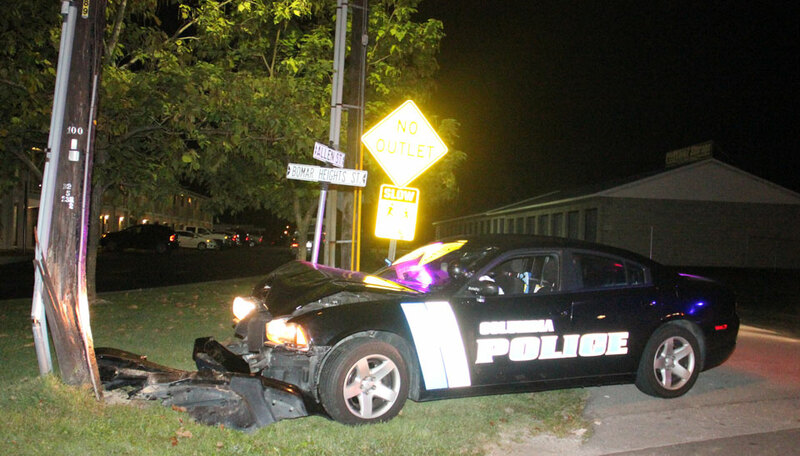 Early Saturday morning, Columbia Police arrested 2 Adair men after responding to large party that resulted in shots being fired and a police cruiser being stolen and subsequently wrecked. At 1:01am Adair County 911 received a report of a large party with physical altercation occurring near the 200 block of Tutt Street. CPD officers were dispatched to the scene and upon arrival, as officers were exiting their vehicle, officers were notified that shots had been fired and officers heard at least 1 shot. Officers ran to the back yard to investigate and, as a result, 26-year-old James Haywood of Columbia was arrested on charges of Wanton Endangerment 1 st degree, and public intoxication with additional charges forthcoming. During the time officers had scrambled to the back of the residence to a possible active shooter, another male made his way around the house and jumped into Ofc. Drew Conn’s assigned patrol car, activated the emergency equipment, and fled the scene in the stolen cruiser. The suspect wrecked the cruiser approximately 1 mile from the scene when he lost control of the vehicle at a high speed in a curve on Bomar Heights. The cruiser struck a utility pole at the intersection of Allen street and the suspect fled on foot . As a result, 5 additional officers were called out to assist the two officers already on scene in dispersing the party and searching for the suspect. At 02:47 am, their investigation led CPD to Heartland Circle to the possible location of the suspect in the theft of the police cruiser. At 03:42 am CPD took 20-year-old Lova Johnson into custody on charges of: Theft by Unlawful Taking Auto over 10,000 dollars, Criminal Mischief 1st Degree, Leaving the Scene of an Accident, Theft of a Firearm and Wanton Endangerment, 1st Degree. Additional charges are pending. Both Haywood and Johnson were lodged in the Adair County Regional Jail. Ofc. Drew Conn and John Dial are continuing the investigation. Conn and Dial were assisted by Chief Jason Cross, Sgt. Jr Murphy, Ofc. Josh Brockman, Ofc. Jordan Dean, Deputy Josh Durbin and Constable Jason Rector .